11) These models by Roy Pickford were on show at the Salford Quays Heritage Centre, but what district of Salford, next to the former Docks, do they recreate? 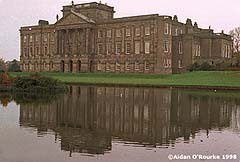 12) This house was "Pemberley" in the BBC drama "Pride and Prejudice", but what's its real name? 13) These distinctive hi-tech buildings next to the Bridgewater Hall are named after the Halle Orchestra's most famous post-war conductor. What is his name? 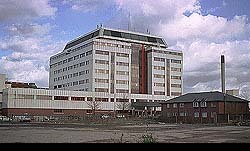 14) This hospital is where many Mancunians started out in life, but what's it called? 15) In early 1999, the great house on the left was up for sale. 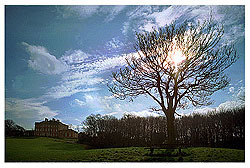 With stunning views over parkland to the north Manchester, it's also convenient for the shops at Middleton. What's the name of the house? 16) It's the very first of a series of swing bridges across the Manchester Ship Canal, but unfortunately, this one no longer swings, as a new fixed road bridge was built next to it. What's the name of the bridge? 17) Will Greater Manchester eventually end up as one giant out-of-town trading estate? Quite possibly, if many more examples of the area's industrial heritage are demolished, like this one. Can you give the location of the last cotton spinning mill to be built in the UK (1920)? 18) During resurfacing of St Mary's Gate, some old tram tracks were uncovered. But in which year did Manchester's last tram run (before Metrolink, that is). 19) In a controversial 1990's redevelopment scheme, a post-modern glass office tower was added to this venerable old building on King St, designed by Charles Robert Cockrell, and opened in 1846. What was the building? 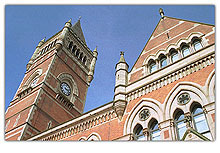 20) This building was renovated and extended in the 1990's, but what is it?